1 of 3 Beat butter and granulated sugar in bowl until creamy. Beat in egg and molasses. Combine flour, baking soda, and both gingers in small bowl. Stir into butter mixture. Divide dough in half; shape into disks. Wrap in plastic wrap; refrigerate 1 hour. 2 of 3 Heat oven to 350 degrees F. On lightly floured surface, roll half of dough to 1/4-inch thickness. Cut out stars. Transfer to ungreased baking sheets. 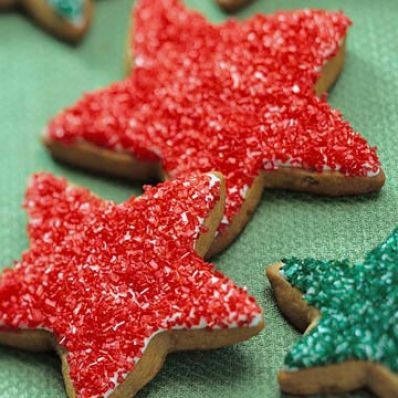 Gather scraps, refrigerate and re-roll for more cookies. Chill cookies 10 minutes to firm. 3 of 3 Bake cookies at 350 degrees F for 10 minutes or until lightly browned. Transfer cookies to wire racks to cool. 1 of 1 Blend confectioners' sugar, powdered egg white, and 1/4 cup warm water in a bowl. Beat on high for 7 minutes, until smooth, with a honeylike consistency. Ice cookies; coat with colored sugars. Let stand to dry.